Samuel Evans is quickly accumulating gold medals for his prowess in Taekwondo. The student competed in the Black Belt cadet division 12-14 years at the NSW State Taekwondo Championships and at the Gold Coast Open, winning gold at both. Samuel has been involved in the sport for about five years and relishes “the challenges and experiences of pushing my body to the limit every single time I train and fight,” which is at least six training sessions per week. Currently holding a Black Belt 2nd Dan, Samuel hopes to achieve a place on the Australian National Team to compete at the World Cadet Championships later this year. 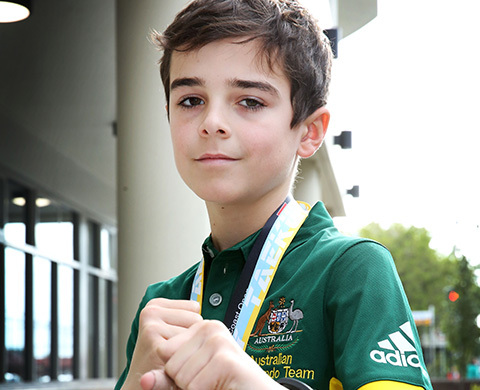 “Last year I represented Australia at the Oceania Championships in Fiji and received a silver medal which has been my Taekwondo highlight to date. The opportunity to represent my country again is something that I am very passionate about and hope to one day compete in the Olympics, with the graciousness of someone like Australian Taekwondo Olympian Safwan Khalil,” said Samuel.